Why do these cars always get bought by reckless people? 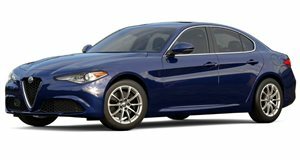 The Alfa Romeo Giulia has not been on the market for very long, at least in the US. Yet we've already seen two pretty bad accidents involving Giulia QVs. One of these instances involved a front end collision in the Netherlands because of a drunk driver, and the other involved a manual model bring crashed on the Autobahn. These were both pretty bad, but this latest Alfa crash has the most damage by far. The car is listed on Copart, a website specializing in selling totaled cars to those in need of parts. This Alfa Romeo is being sold as-is (yeah, that's for sure) with no reserve. With less than three days remaining on the auction, the bid currently sits at $525 as of this writing. Clearly, this Alfa Romeo is beyond repair, but it may be worth it to grab some parts from. The primary damage is listed as "rollover" and the secondary damage is listed as "biohazard/chemical." There doesn't appear to be a single panel on the exterior that can be saved, although we wouldn't mind plucking off that Alfa Romeo badge on the trunk. The owner really did a number on this car, which should serve as a reminder to drive responsibly. Just because someone can afford a fast car, doesn't mean that they know how to drive it well. The other Alfa Romeo crashes that we have seen are repairable, but this one is far from it. Now there is one less Giulia QV on the market for enthusiasts to buy on the cheap after they depreciate.